Everything about The Perks of Being a Wallflower is subtle. As it should be. From its beautifully subdued soundtrack to its washed out color palette. Even in the most flashy of performances and moments that creep towards the melodramatic this lovely film is limited to its inherent honesty. I have never read the book by Stephen Chbosky on which this is based, but I will be sure to pick up a copy to really understand the culmination of our main character. I found myself, throughout the entire film, wanting to really get a grasp on the writing of our main character in order to get to know him all the better. The film does more than a fine job at this, don't get me wrong. It is more a justification of how well this film draws you into each and every character we are presented with that we want to continue on their journey with them, that we never want it to end. I can only imagine the kind of emotionality that goes into re-creating ones experience at such a delicate time in their lives but Chbosky, who not only is the author of the novel but also adapted it to a screenplay and then directed the film has done so in award-winning fashion. He shows the natural intuition of a seasoned director as he manages each of his characters and their equally important journeys with such care that we truly feel the effects of that first love, those traumatic experiences that come with every high school experience, the loss of innocence and how what we feel in being carefree will always exist as shadows of those moments will forever stay with us; meaning so much more than anyone who recalls them around you will ever know. They will never know the individual, personal experience of what memories your mind drifts to, but this movie provides a universally identifiable yet uniquely individual story of one boys account that will not only move you, but help you to understand life a little bit better. different interpretations of their shop project. The story we see unfold is one that is essentially touching on growing up. Something that we are all forced to do, even if we regret rushing it once we get there. I don't know that there has ever been a person wise enough to not be envious of the attractive aspects of adulthood that it doesn't cause them to want to hurry through adolescence. Naturally, there are no real exceptions to that rule here, but instead young human beings who understand the moment they are at in life is pretty damn great and they are going to take advantage of it. We are first introduced to Charlie (Logan Lerman) as he enters his freshman year of high school with the humble goal of trying to make a friend on the first day. Friends are a big deal to Charlie, his older sister is a senior and his even older brother has just left for college at Penn State on a football scholarship. Charlie's parents are nothing if not typical. They aren't overbearing, but their children seem to know what they expect. His father (played at just the right temperature by Dylan McDermott) probably drinks a little too much and his mother (Kate Walsh) could probably show a little more interest, but then again Chbosky might have felt their influence wasn't necessary as it's clear parent issues are not what Charlie is worried about. Charlie is simply trying to find where he fits in. He seems very sure of who he is, despite what he has been through (which I won't divulge here, the way it unfolds in the film and to such perfect effect is much too good to spoil) but clearly finds it hard to carve out a place with others who seem to share his sensibilities. So, it is nothing more than a blessing when misfit seniors like Patrick (Ezra Miller) and his step-sister Sam (Emma Watson) take in Charlie to their exclusive group where he feels, for the first time, he can truly be himself. become friends with a unique bond. 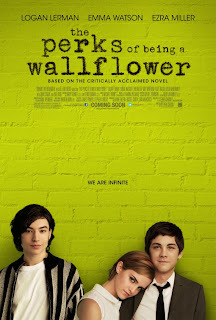 While Chbosky has created a film that will live on for generations as those John Hughes films of the 80's do, The Perks of Being a Wallflower will be referenced by teenagers of the time period it represents as well as teenagers of today. It could really be set in any time period and the dynamics, the relationships and the conflicts that these teenagers go through will be the same they just might have a different set of stipulations. This is the closest thing we will likely ever have that touches the magic of those Hughes produced movies and, as in the cases of those films, what will really live on and stick with you long after the movie has come to a close are the characters. I was surprised to hear Lerman would be playing the socially awkward Charlie, the angst-ridden teen who also needed to convey the necessary amount of charm to be appealing. Lerman can certainly be appealing as he has proved in big budget bombs like The Three Musketeers and Percy Jackson, but being given those type of leading man roles made this seem a bit out of character. The actor surprises at every turn, making Charlie the most genuine kind of wallflower. He is smart, he knows and understands things, but he doesn't flaunt his superiority to his peers because his humble ways don't allow him to be too self-assured. It is a complex personality to set forth but Lerman delivers this even in his vocals that narrate our story. Our protagonist owes a good amount to his co-stars for helping make his personality shine though, there is no doubt there. Ezra Miller plays Patrick with a drama queen attitude and flair for the abusive honesty his classmates would like to sweep under the rug. Miller is clearly a force to be reckoned with (especially if you saw him in last years We Need to Talk About Kevin) and he brings a certain weight to every second he is on screen whether it be to comedic or dramatic effect. Then, there is of course Emma Watson who nails an American accent, but more importantly turns in a better, more mature performance than she was ever able to give in the Harry Potter films. As Sam, Watson breathes an intelligence that could only come with understanding where her character is in life. Lerman is our anchor, but Miller nearly steals the film and Watson simply makes this whole affair feel less of something that could have come from the mind of any screenwriter. She seems to have a real connection, a personal need with and from the story that is taking place. That coming-of-age tale that includes every emotion that comes along with real life. The whole movie could be described in the same way. The performances only make these facts even more true. There is no other way to put it other than to flat out say I loved this movie. It is so good and I enjoyed every minute of it. Never have I felt so often moved by a picture and at the same time so invigorated to go out and live by the virtues its preaching. It doesn't talk down to its audience. It isn't trying to teach us a lesson and it isn't judging us through the way it treats its characters. It doesn't throw moral guidelines at us, more it is simply providing an earnest interpretation of what being a teenager feels like and showing how everyone can find something to relate to in that stage of life. No matter if it were the ways in which these kids interact with one another or the moments in which they realize and come to that epiphany that expands their minds past not just who they are but into what else is out there and who they (or we) could be in this bigger landscape our confined mind could have ever hoped to imagine. There is a real sense of ephemeral bliss to everything that happens in the movie and that relates to the crowd even more. You can relate so much that you can feel the similarities between what you did, might, or are going through and it seriously takes you back and puts you in that moment. It gets to you. If you don't feel anything from it, if you don't get a sense of nostalgia at the very least I don't know that you even understand the point of film. Spending two hours with these folks makes anyone who has ever felt lost know that there is something or someone out there who completely understands them and as cliched or pretentious as that might come off it, as the movie is able to effortlessly convey, is only meant in the most genuine and heartfelt of ways. This film is a true experience, a flash of memories and a rush of excitement. Above all, it is timeless and I expect it will stay with me more than any other film this year.